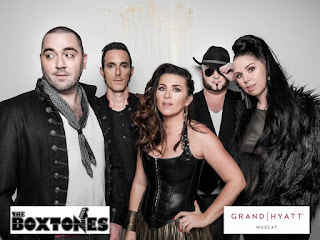 Tonight is the night where the Grand Hyatt host a great band from Dubai, The Boxtones, in their gardens. Tickets are available on the door, RO 10 including a drink (unless you have a MRFC membership card, and then you get a second drink). Congratulations to Dowel Deligos who won the pair of tickets I had to give away - thanks everyone else for participating! Doors open at 6:30, the band plays sets from 8pm - 11pm and then there is an after-party at "The Club" (Copa) where door entry is free with your Boxtones wristband (or its RO 5). You can get tickets by calling Joseph on +968 9507 7670 or buying them on the door tonight from 6:30.